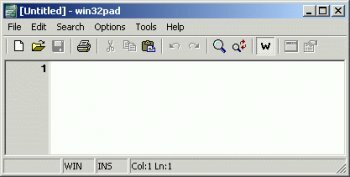 Win32Pad is a feature filled text editor that is written with a programmer in mind. Its main purpose is to provide enough functionality that is missing from notepad without sacrificing file size and performance. It's very fast and powerful. Has a ton of features that you would expect (Filesize is NOT limited to 64k, Recent Files, Auto-indent, handles Windows and Unix files, customizable Tab Size and Font settings, and many more). Win32Pad's possibly most important feature is that it is portable from USB flash. Documented but only on the forum are several ways to create a zero-length win32pad.ini file as preparation (a blank slate with the right name). If the user does that before running Win32Pad, Win32Pad finds this .ini and proceeds to write the user-settings into it. One way cited is to type «echo.>Win32Pad.ini», at the command-line, which creates an almost zero-length file (4-5 bytes), which works fine. MetaPad has a few added features, but it does not save settings in a way which is portable on flash. One of MetaPad's «killer» features is to strip away paragraph-returns at the end of lines, or to put them there as desired (e.g. to have each line be at or under 80 characters). That feature is however also found in Ted NotePad. I use Win32Pad for everything else however because I like its smallness. This is very good......Thank you! This is 1 of the premiere Notepad replacements. It's intended to be a lightning fast text viewer-editor with a few enhanced features. It is not intended to be a mini word processor. Anyone that rates Win32Pad lower than 4 has no idea about the program's purpose, and never will. A superb replacement for M$'s Notepad.exe. Amazingly small size. Fast and stable. Lots of features for its size. I rate it 4.899999, rounded to 5.
hkm: This is the first time I hear of such bug report. Please, please send me the exact details. Either in the forum or the e-mail address listed in the About box. Not so hot. As other reviewers have said, there are other, better freeware versions. I had been using this on an old Win98 'puter to annotate some file lists, etc before I junked the PC. I thought it was pretty good, esp small size, and you can exit with a simple ESCape key. It can be minimized to the tray, too. I used it because it was small and recognized HTML, so I could just click on a link in a textfile. Hence, NO SO HOT. I, like others, have gone with MetaPad, EditPad Lite, KeyNote, etc., etc. This is a small and fast text editor. It doesn't have syntax highlighting, but it is useful. Some of the features seem to be pick right out of Metapad (http://www.liquidninja.com/metapad/. Also it does not support Windows XP's visual styles. But overall it's a good little notepad replacement. The "programmers" can always use Notepad2 (http://www.flos-freeware.ch/notepad2.html). It is one of the fastes text editors out that has a lot more features than notepad and even Win32Pad. It also has syntax highlighting for numerous languages and scripts. i love this app. been using it instead of notepad for years. if you need to do some serious text editing, something else would be better. but for .nfo's and text files and viewing html source, it doesn't get much better or lightweight than this. Very good remplace of Notepad!!! Only one problem: when I print a file the font that use is too big! I have to configure each time an apropiate font to print!!! Win32Pad is good, but Metapad ROCKS!!! Why use anything less than the best?